​Tollak Rafto works as a percussion instructor and private teacher throughout San Diego county. He teaches marching percussion, drum set and specializes in mallet percussion. He currently works with high schools throughout northern San Diego. Past instructional experience includes WGI World Class ensemble Dark Sky Percussion as well as DCI Open Class ensemble Gold Drum and Bugle Corps. He proudly endorses Innovated Percussion Inc. sticks and mallets. Phillip Viani has been a percussion instructor at Carlsbad High School for five years. Upon graduating high school, he went on to march The Academy Drum and Bugle Corps and marched two seasons of indoor drumline with POW Percussion in 2014 and 2015. Phillip aged out with Pulse Percussion, winning the WGI World Championship in 2016 and a WGI Bronze Medal in 2017. Phillip has taught a few other high schools in North County, as well as Gold Drum and Bugle Corps for the 2017 & 2018 seasons. Phillip is currently attending San Diego State University pursuing a degree in Business Administration with an emphasis in Marketing. ​David Ramirez is a percussion instructor from Temecula, California. He has been involved in the marching percussion arts since 2010. He graduated from Great Oak High School, where he marched in the school’s marching band and drumline. His marching experience includes Pacific Crest, POW Percussion, the Blue Stars Drum and Bugle Corps, and most recently Pulse Percussion (2017 and 2018). David has been teaching percussion since 2015, and currently teaches at several schools in Riverside County and North County San Diego, David attends school at MiraCosta College, where he is pursuing a degree in Computer Science. He lives in Temecula, California. Mark Anderson is a 21 year old college student who currently lives in Poway, California. The fall 2018 marching band season marks his 2nd year as percussion instructor at Carlsbad High school. Since 2010, Mark has been involved in the marching arts. Graduating from Poway High School in 2014, Mark spent four years with the Poway High Emerald Brigade and continued on to march multiple world class ensembles. His experience includes playing bass drum at Pacific Crest Drum and Bugle Corps, Pulse Percussion, and the Blue Stars Drum and Bugle Corps. Beyond marching percussion, Mark is currently pursuing a degree in English Literatures. ​Olivia Zahniser is in her fourth year of being a front ensemble technician. She graduated from Oceanside High School in 2015 where was in the marching band and drumline for all four year. Olivia has also marched with Gold Drum and Bugle, Crossmen Drum and Bugle Corps, and is currently with Dark Sky Percussion for her third year. Olivia is currently going to school at Mira Costa College pursuing a degree in music performance in percussion and plans to transfer to CSU Long Beach. ​Bella Merino has been an instructor at Carlsbad High School for 5 years. She graduated from San Marcos High School and is currently attending Cal State San Marcos to receive a Bachelors degree in Communication. She received her associates degree in Communication Studies in Spring 2017 from Palomar College. She is going on her 5th year marching with Independent Winter Guard Vox Artium. Bella's additional instructional experience includes San Marcos High School, Vista High School, and the Oregon Crusaders Drum and Bugle Corps. Aileen Loza is a graduate from Rancho Buena Vista High School where she marched all four years with the RBV Color Guard. She is currently attending Cal State San Marcos to receive a Bachelors Degree in Communications in Sciences and Disorders. She marched with the Independent Winter Guard Vox Artium from 2017-2018. This is Aileen's first year as a Guard Instructor with the Marching Lancers. Alyssa Keene graduated from UCLA in 2014 with her degree in Trumpet Performance and as a 4 year student of international soloist,Jens Lindemann. She has extensive experience in the classical, jazz, pop, rock, and modern classical genres, having performed with artists such as Stevie Wonder, BB King, Portugal. The Man, Pat Sheridan, and many others. She was a finalist in the 2012 National Trumpet Competition: Ensemble Division, and has also had the opportunity to perform abroad in Europe and at multiple national/international music festivals. She is passionate about young players embracing their fullpotential, and also about teaching them how to enjoy and embrace this unique musical learning process through mental exercises and further self-understanding/awareness. ​Juan Jasso is the current Woodwind Caption Head for the Carlsbad Marching Lancers. He is also the Woodwind Caption head and Drum Major Instructor for the San Marcos High School Knight Regiment. His past experience in conducting and woodwind pedagogy influenced him to pursue a degree towards Music Education at California State University Fullerton. An aspiring musician he performs different style of music in multiple settings all over Southern California. Juan is currently a Saxophone Major in which he is part of the Symphonic Winds at CSUF, as well as multiple jazz combos, sax quartets, and small ensembles. Additionally, he is a local music instructor to individuals and groups, including the San Elijo Middle School House Jazz. Having marched six seasons through DCI; three with the Spokane Thunder (11’-13’) and three with the Madison Scouts (15’-17’), Nick has a strong passion for the marching arts. 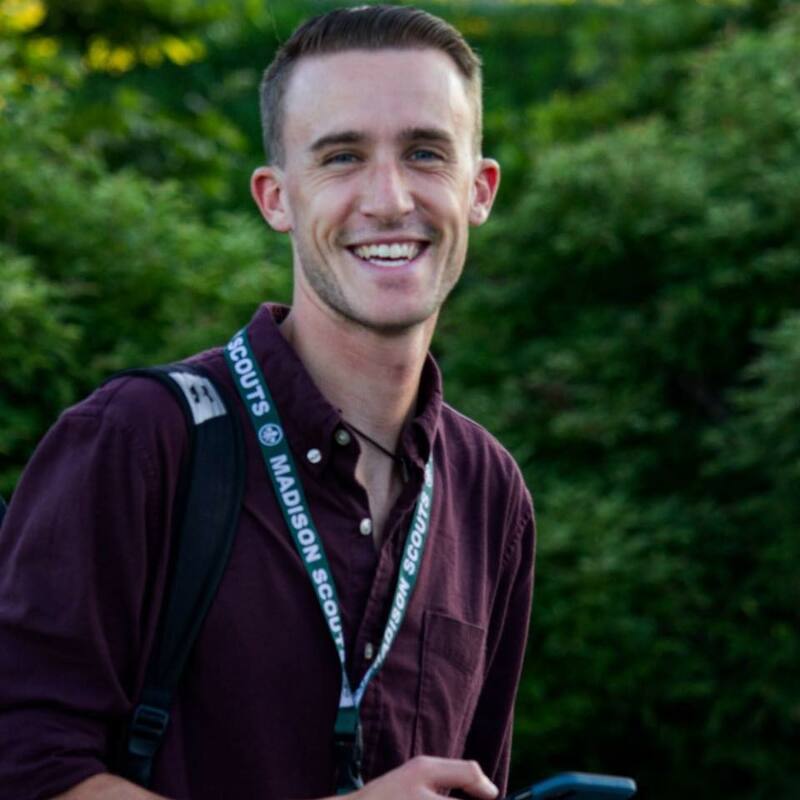 After aging out of DCI, this past summer, Nick returned to the Madison Scouts as a part of their administration team. He currently works as the Visual Caption Head at Carlsbad High School and as a visual instructor with Vista High School. Nick lives in San Marcos, CA. Nick Viani graduated from San Marcos High School in 2016. He was a member of the Knight Regiment throughout his high school career. He is attending Mira Costa College where he is studying Business Administration. This is his third year teaching as well as designing for Carlsbad's field show. His past experience is marching with the Pacific Crest Drum and Bugle Corps.